There’s a lot of activity going on at Powderhorn Ranch to get the site ready to be handed off to Texas Parks and Wildlife Department in a few years. The spectacular property on the coast near Port O’Connor was acquired in 2014 by TPWF and will one day be a state park and wildlife management area. In the meantime, habitat restoration, infrastructure repair and public use planning are underway. In the past year, 2,800 acres of running live oak have been treated to improve habitat. Running live oak chokes out native grasses and degrades wildlife habitat. Limited public use opportunities are being developed, and two youth hunts on the property are scheduled for December. Other public use opportunities, such as paddling and birding, are being explored for 2017. 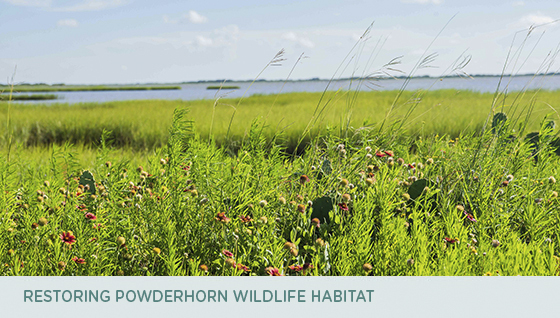 There is a lot in store for Powderhorn Ranch, and donations are still being accepted to ensure a bright future for the property. 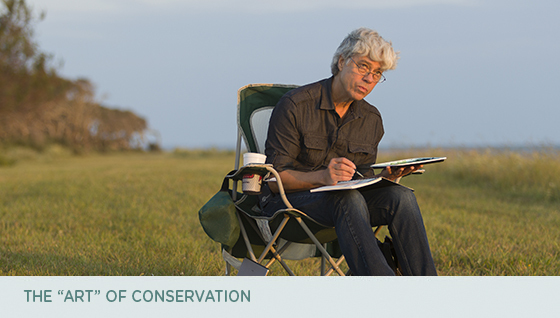 Texas artist Billy Hassell got a sneak peek at Powderhorn Ranch when he painted a watercolor study for the first lithograph in a series of five pieces of artwork commissioned by TPWF. A portion of the proceeds will benefit the wild things and wild places in Texas. Video crews from Texas Parks and Wildlife Department’s television series followed Billy as he created the first lithograph, and the segment will air on PBS stations across the state later this month. You can get a sneak peek of the PBS show segment by viewing this video. Find information about these limited edition lithographs, including purchase details, on the TPWF website. 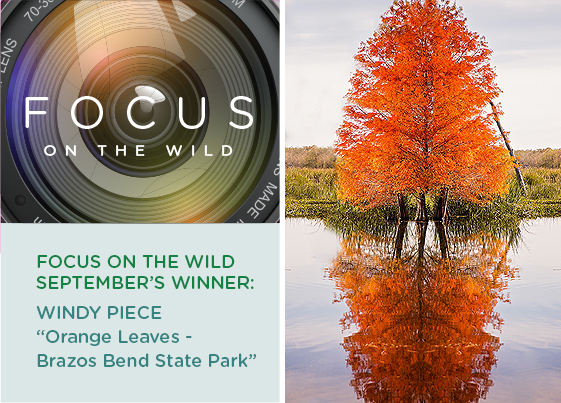 Congratulations to Wendy Pierce for being the September winner in our photo contest! Wendy lives in Pearland and took this stunning photo during a family camping trip to Brazos Bend State Park last year. This October photo contest theme is “Take a selfie with your favorite game warden.” You might run across a game warden in the field, or on a lake. If you are near Austin, stop by McBride’s Guns and chances are, you’ll probably run into one, or maybe more! Speaking of McBride’s, check out the prize package Joe McBride is donating for this month’s winner: a stainless steel Browning X-Bolt Rifle 300WM with a walnut stock. What are you waiting for? Head to the field, find a warden and snap a selfie! To have a chance at winning, be sure your photo fits the theme and is submitted by the 25th of October. Read the contest rules to find out more. Since we have wardens on our mind, we caught up with Texas Game Warden Grahame Jones for this month’s Texas Parks and Wildlife podcast. Listen in and find out what our wardens are up to these days. Enter Big Time Texas Hunts by October 15 for your chance to win 9 guided hunt packages on the finest ranches and wildlife management areas in Texas. All Big Time Texas Hunts packages include guide service, food, lodging and on-site transportation. Proceeds from Big Time Texas Hunts support public hunting opportunities and wildlife habitat conservation in Texas. They have helped fund everything from bighorn sheep restoration efforts, to feral hog traps, to new hunting blinds and hunt camp improvements for public hunters.